This guide describes the steps required to search the databases in the “Churches” category. A companion guide “How to Use the New Search Engine“, walks you through the steps to search for data records in any of the four “People” categories (People Birth, People Marriage, People Death or People Other). It should be reviewed first as it contains valuable information that is not repeated here. We have two databases in the “Churches” category and although we call them databases, in reality they are simple tables that list the Churches in each respective category. This database/table, available to PGSA members only, lists the 56 Polish Parishes that were recorded in the book A History of the Parishes of the Archdiocese of Chicago and is available to PGSA members only. A detailed history of each parish is available. These parish histories were provided with the permission of the Chicago Archdiocese. 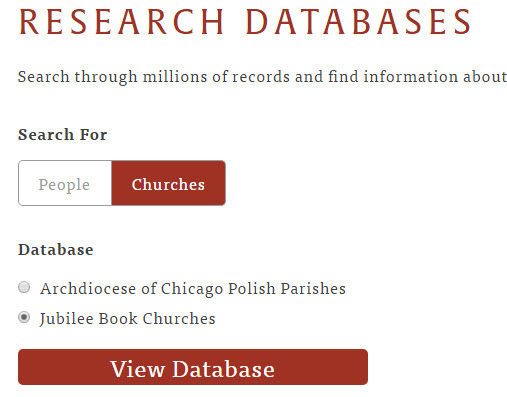 To search this database/table you must be a logged in as a PGSA member otherwise, you will not be able to select the “Archdiocese of Chicago Polish Parishes” database. 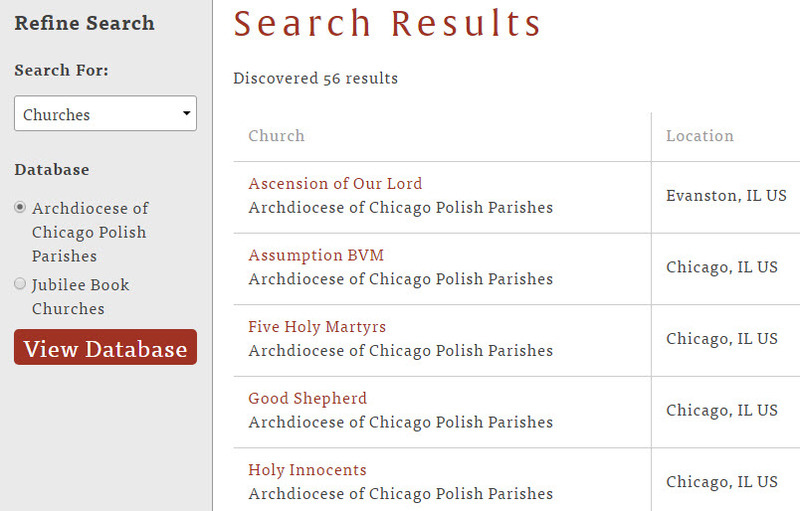 When you have logged in, simply select the Churches “Search For” category then select the “Archdiocese of Chicago Polish Parishes” database, and click on the red “View Database” button. 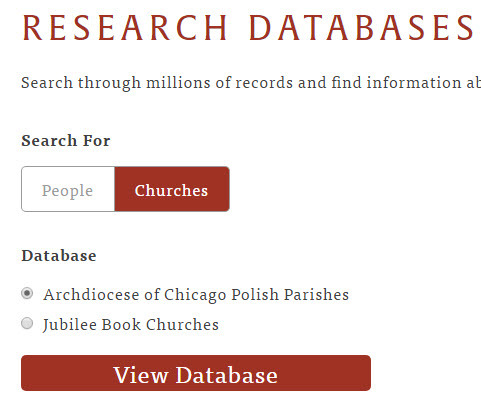 The search results page will list the 56 Polish Parishes in the Archdiocese of Chicago with parish histories that are in this database. 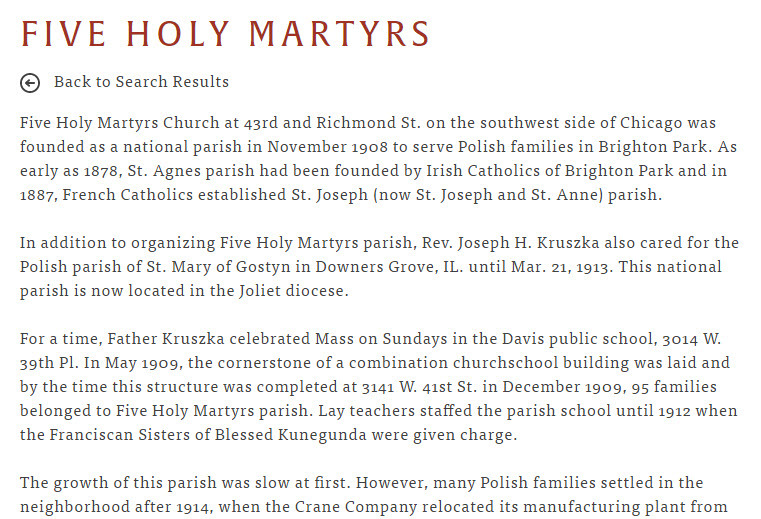 Click on the name of a parish to access its history, for example, click on “Five Holy Martyrs”. This database/table, available to all visitors, provides a list of the 359 churches whose Jubilee books have been indexed by PGSA volunteers. It is intended to supplement the data records that can be accessed via the “Jubilee Book Index” database in the “People Other” search category. Simply select the Churches category and the Jubilee Book Churches database, then click on the View Database button to access this database. The results page displays the 359 U.S. churches with Jubilee books that have been indexed by PGSA volunteers. 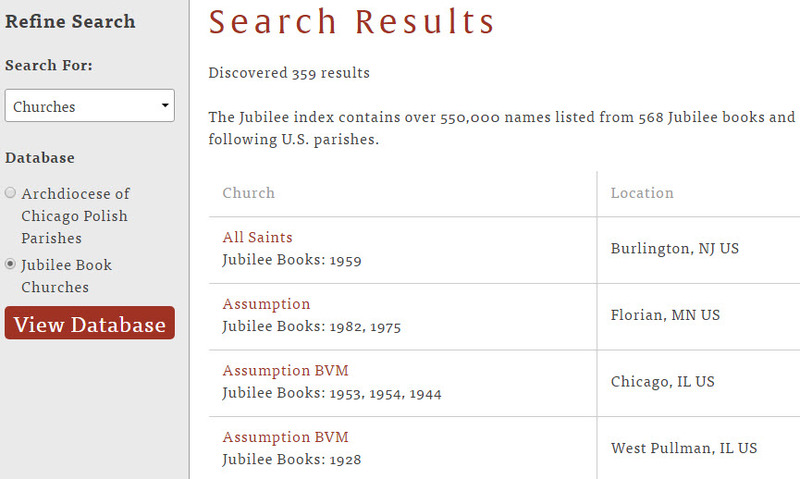 This listing can be used to determine if a particular church has indexed Jubilee books in our database. 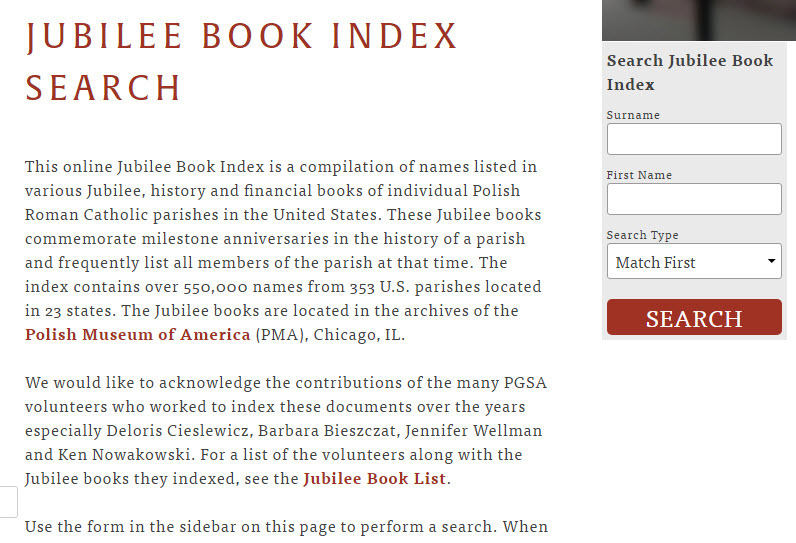 If you click on the name of “any” church listed in the results page you’ll be directed to the “Jubilee Book Index” page where you can search for surnames of those people whose names have been indexed by PGSA. Use the instructions in the “How to Use the New Search Engine” companion guide to search through the Jubilee Book Index. 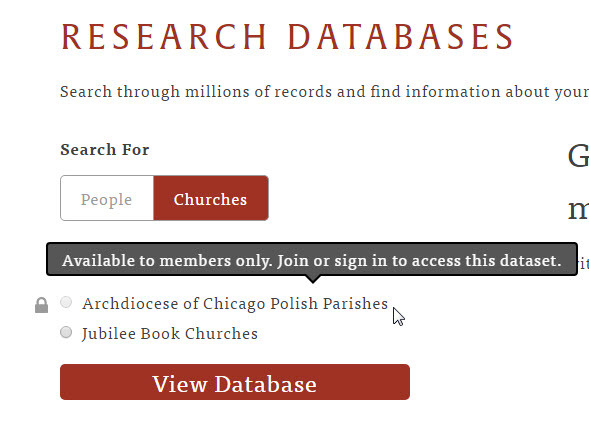 Hopefully, these instructions are sufficiently explicit to allow you to search the two “Churches” category databases (Archdiocese of Chicago Polish Parishes, Jubilee Book Churches). If you should require more help, please let us know.